Ahh… today is my day alone and leaving Lucy for the first time in a hotel. To ease my guilt, I decided to take Lucy to play at a local off leash dog park close by. Difference between Santa Fe parks and Houston parks is there is no grass in the Santa Fe parks… a bit disconcerting for lil Lucy at first but we met some very nice pups and she ran around for a bit. Afternoon was very exciting! Got Lucy tucked away in the hotel in her crate with tv on for noise and I was off on my adventure. 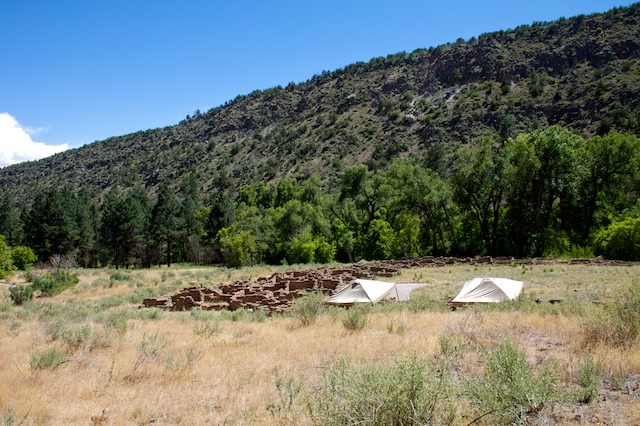 Drove about an hour west of Santa Fe into the mountains to Bandelier National Monument – again it is really a national park but size dictates the “monument” term – very strange. The weather was great just a little hot but nice breeze and clear blue skies. 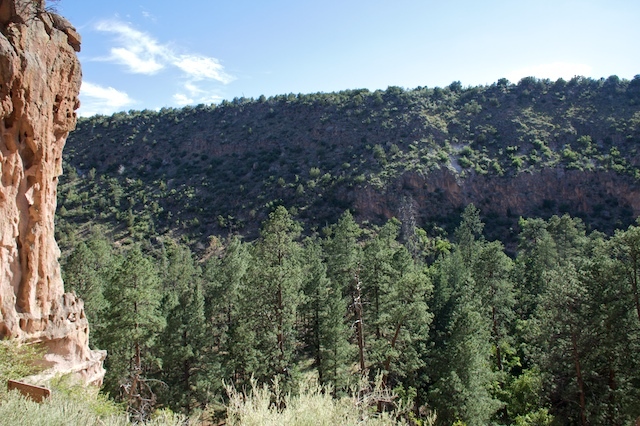 Bandelier National Monument sits at the southern end of the Pajarito (Spanish for little bird) Plateau. 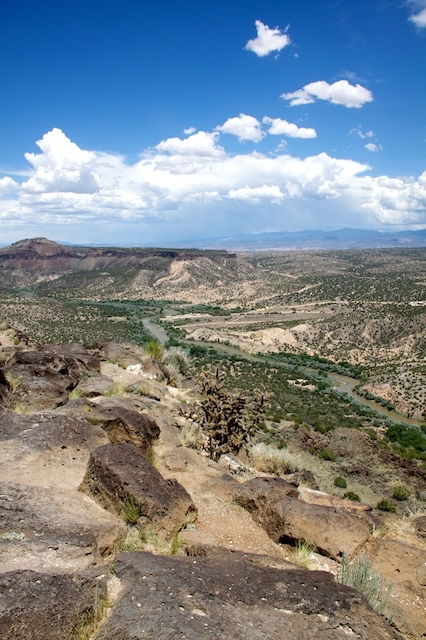 The plateau was formed by two eruptions 1.6 and 1.4 million years ago. and by the many pueblo dwellings evident in the caves walls. There were several cliff caves that could be accessed by short ladders so of course I just had to climb them. 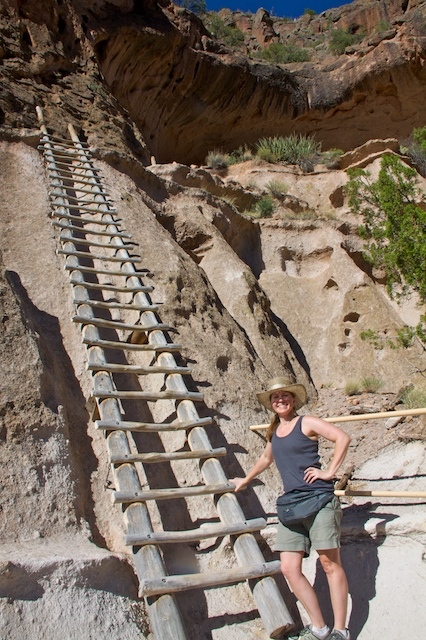 I relate it to the Kevin Costner movie “Field of Dreams” – it they build it then climb it… 🙂 I had seen the ladders pictured in all the brochures for the park and stupidly thought that I had just climbed the big one. Dumb, dumb me… the big climb was a side trail known as Trail to Alcot House. Vertical climb of 140 feet up the cave wall by way of a series of 4 ladders – wooden handmade ladders bolted to cave wall. When I arrived at the cliff wall there were several hikers already climbing up. I had to wait my turn. I was a little nervous…. Finally it was my turn with no one waiting behind me. I started up the first ladder and it was ok then I got to the second ladder which was a little taller. I climbed slowly as the elevation still was hard on folks that were not used to living at this altitude. The third ladder was the really tall one. The rungs of the ladder were much bigger than my hands could grip all the way around. I got half way up the ladder and the fact that I was so high up started sinking into my head. I did not look down but I did stop and take a moment and then it hit me… I was alone and my cell phone did not have any reception and my hands were shaking a little. So I climbed back down to the base of the third ladder. Then just caught my breath and looked around. I did not come all that way to stop now. I have climber much higher in areas less safe (Chichen Itza) so I made up my mind that I was doing it. I started back up the ladder slowly and carefully constantly thinking about Lucy and if I fell Lucy was alone in a hotel scared so falling was not an option. I made it to the top of the ladder safely. The fourth ladder was short and I did that one easily and finally made it to the cave that could easily have held 50 people. I sat down quickly because my legs were shaking. Finally got the nerve and looked around at all the tree tops in the shining sun. Wonder what the ancient peoples thought when they sat here in the same spot many, many years ago… The decent was easy and at the base of ladder three there was another hiker who graciously took my picture. Whew that was over and I felt awesome! Definitely a good day. Lucy was very excited when I got back to hotel as was I. ← Discount on Mustang Prints – this weekend only!